В этой статье поговорим о том, как подготовиться и успешно выполнить задание 3 из раздела Говорение, ЕГЭ 2015. Задание 3 представляет собой монологическое высказывание. На выбор вам будут представлены три фотографии. Вам необходимо выбрать одну из них и описать её на основе предложенного в задании плана. Продолжительность вашего ответа - 2 минуты. As you know I enjoy travelling and I never miss a chance to take pictures of famous sights. So, I took this photo last summer when I went to London during my holidays. In the foreground of this photo you can see the London Eye which is the largest observation wheel in Europe. It is located on the south bank of the river Thames. In the background there are some modern buildings. As you can see the day is dull and gloomy and the sky is grey with clouds. It looks like it's going to rain that is very typical of London. But nevertheless there are always a lot of people waiting to ride this popular attraction. There are 32 (thirty-two) capsules on the wheel which are rotating very slowly. Each capsule contains 25 (twenty-five) people. 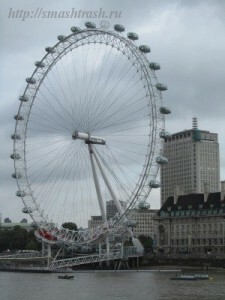 I took this photo because it is a well-known landmark of London. From the very top of the London Eye you can enjoy a stunning view of this magnificent city. One can see the river Thames, the Houses of Parliament with its famous Big Ben, Westminster Abbey and other sights. I know that you have never been to London before, so I decided to show you this picture and share all my impressions of this terrific flight with you. The journey was really exciting and I hope you will visit this city someday. I took this photo in April when I went to Paris to study French. Some of my classmates and I participated in the exchange program (me). We had our classes in the morning and in the afternoon we went sightseeing. The picture shows a panoramic view of the city. I managed to take it from the Montparnasse Tower. In the foreground of this photo you can see the Eiffel [´aifəl] Tower. 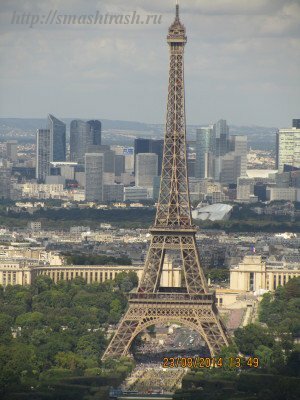 It is a 300 metre-high metal construction which is often used as a symbol representing Paris or France. It was completed in 1889. At the foot of it you can see a lot of tourists that are eager to get to the top of the tower. I took this photo because the Eiffel Tower is a famous landmark of Paris and I wanted to enlarge my collection of pictures with beautiful sights. I decided to show you this photo in order to inspire you to join my trip to Paris next time. In the background of this picture you can see the Cathedral of St.Basil the Blessed. Its tremendous domes struck my imagination most of all. It's unbelievable but none of them looks like the others. Each dome has its own shape and colour. Once I have read a legend that Ivan the Terrible blinded the architects Barma and Postnik because he didn't want them to create another masterpiece. There is a lot of greenery in the courtyard of the Cathedral. 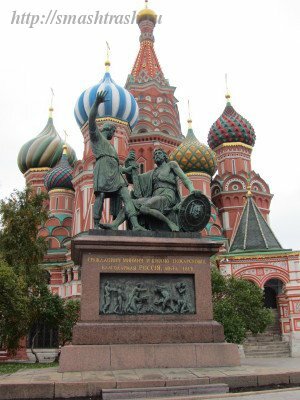 In front of the Cathedral there is a monument to Minin and Pozharsky. I decided to show this picture to you because you are fond of history and often make reports for history classes. So, I think, you can use it for your school project. P.S. Все фотографии, представленные на этой странице, принадлежат автору. 2) Отвечая на вопрос плана “when you took the photo”, используйте Past Simple Tense (простое прошедшее время). Помните, что вы были фотографом, а поэтому вам нужно описать людей на вашем фото (родственников, друзей, знакомых или незнакомых вам людей), а не себя любимого. Вышеприведенная формулировка задания была актуальна в 2015 году. В 2016 году произошли изменения в формулировке задания №3, ознакомиться с которыми можно на примерах из Демоверсии ЕГЭ 2016. Enjoy my short video with a sample answer! If you find these tips useful, please, leave a comment and share the article with your friends. I wish you good luck in your exam! Эта запись написана автором Елена Шрамкова, 08.02.2015 в 00:40, и размещена в категории ЕГЭ Говорение. Следите за ответами на эту запись с помощью RSS 2.0. Вы можете написать комментарий или разместить обратную ссылку на своем сайте.